Shirley Baumgartner, 82, of Lincoln, Nebraska. Born to Elam and Verdena "Peggy" Rumsey in LaMoure, ND. She married Victor Baumgartner in 1954 and were blessed with 5 children: Victoria Elaine who was born with heart problems and died at 22 months old, Richard Elam (Mary Olson) of Pelican Rapids, MN and their sons, Jared and Joel, Julie Mari Kirchhevel of Lincoln, NE and her daughter, Michalene, Scott Edward (deceased 2009) and his children, Terran, Tiffany and Dustin, and Beth Myra of Lincoln, NE. She had six grandchildren and twelve great-grandchildren, whom she loved dearly. They lived in Fargo, ND until they moved to Lincoln, NE in 1977. While in Fargo they were foster parents to 50+ babies that were placed with them through the Catholic Family Services. She also worked at the Fargo VA Hospital. When in Lincoln she worked for Burlington Northern Railroad as a cook for the gang laborers with her sister Elaine. She then worked for Landon's Clothing. After Victor died in 1993 she spent her winters in Southern California and summers at her lake home in Pelican Rapids, MN. She loved to travel and go on cruises. 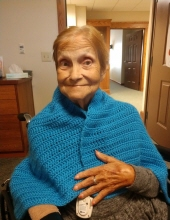 Playing cards and games with her family, especially grandchildren is what she loved most. She was preceded in death by her parents; husband, Victor; sister, Elaine; and her children, Victoria and Scott. To send flowers or a remembrance gift to the family of Shirley Baumgartner, please visit our Tribute Store. "Email Address" would like to share the life celebration of Shirley Baumgartner. Click on the "link" to go to share a favorite memory or leave a condolence message for the family.